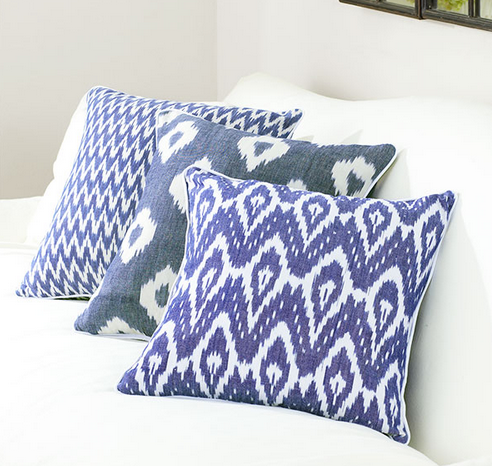 Depending on whom you choose to believe, ikat is either a South American dye technique, an Uzbekistani textile folk craft, or a patterned fabric Target manufactures en masse and ships from a warehouse in Hoboken. Thank heavens they do, because I can't get enough of the stuff. Of course, while addiction feels like a lonely affliction (lying to your mother about the new throw pillows, hiding fabric samples from your significant other in the trunk of your car), no addict is alone. That's because every addict has her enablers: the individuals, social systems, and corporations that aid and abet those longings. Mine is called Wisteria. 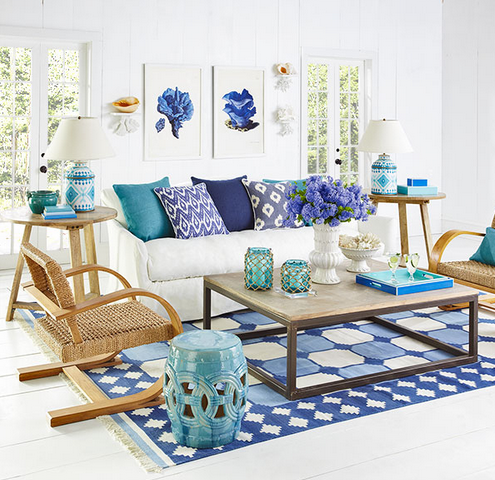 How marvelous is this room in Mykonos blue and white? I fell in love - and I already had the lucite table. I could envision the pillows in my apartment. And fortunately (or unfortunately), they came in green. It turns out the pillows are great (the XL pattern pillow is from Duralee), and a steal at $29.99 per cover. The fabric has a great texture and stands up well to abuse (my throw pillows must think they belong to a linebacker; I'm constantly flopping onto them or flinging them onto the floor to make space). I purchased pillow inserts from Crate and Barrel; they're down, hold their shape, and are oh so cushy. Middle to Right: Wisteria's Zig Zag, Duralee green ikat (available here), Wisteria Diamond, and Ballard Designs bolsters that I trimmed in green velvet ribbons. The "ikat" rug is from Flor. The brass crab on the table is from a vintage store down South, and, true story, when I flew home with it, the TSA thought it was a giant model spider. Good one, guys. Maybe get on one of those planes and visit a beach sometime? What about you? Is there a home design trend you'd go into withdrawal without? 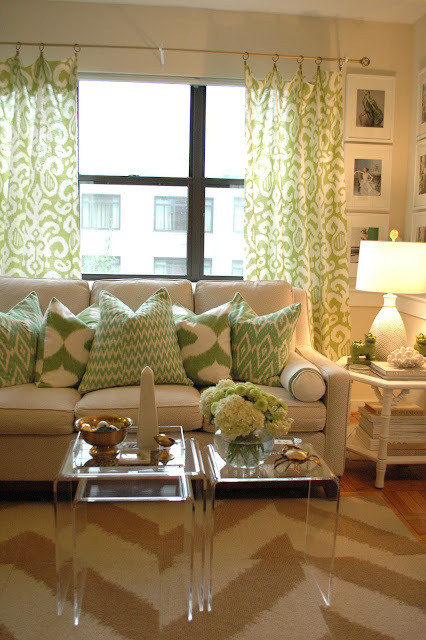 Well clearly your ikat addiction is serving you well cause that living room is so pretty and well put together! I'm a bit obsessed with yellow at the moment and am purchasing way too many home items in yellow from a desk lamp to pillows to yellow jacketed books! Where are your curtains from?! There's hardly a trend I have not gone ridiculous over. I love your living room, it's very beautiful. That dresser/ entertainment unit is gorgeous! Also love your artwork and styling. "Ikat" is definitely a South East Asian dying technique and comes from the Malay word "tie". Trust me, I am a Malaysian. LOL. Great blog, by the way. I am your newest follower. Come by and enter my current art giveaway, if you like! Beautiful living room! 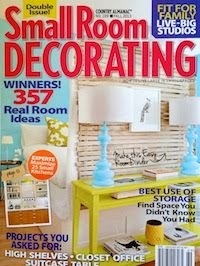 I have that exact end table and have been considering painting it white. I think you've sold me! I also have a similar dresser under my tv next to it that I've been thinking about painting. You've inspired me.